When your home sits amid beautiful surroundings, you should have at least one room where you can relax and enjoy the view. If you can make it a high functioning yet charming room at the same time, so much the better. That was the wish of a Hunterdon County couple who called on designer Jo Ann Alston when they decided to add a sunroom onto the rear of their home. 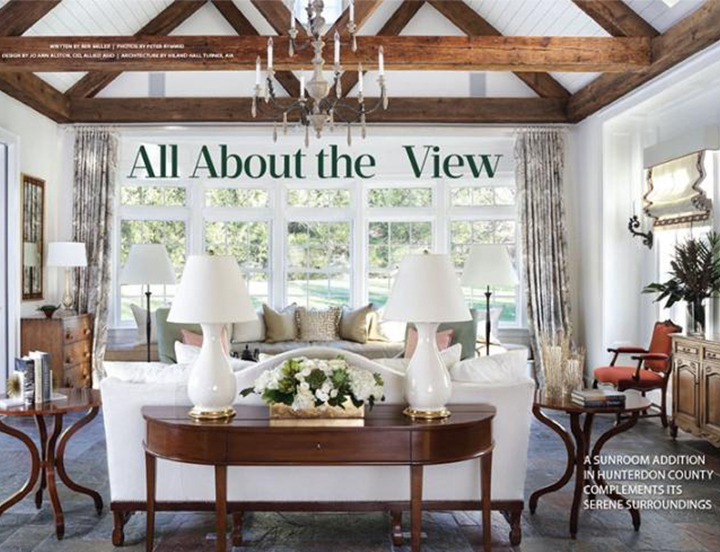 “They’re socially active so they wanted space not only for themselves and their teenaged children but also for entertaining,” says Alston, a state-certified interior designer, allied member of the American Society of Interior Designers and principal of J. Stephens Interiors in Mendham Township. On the wish list: a seating area, piano, pool table, television, beverage center and windows — lots and lots of windows. They also wanted a covered dining porch to use when the weather allows. Early in the process, Alston brought in Hiland Hall Turner, a member of the American Institute of Architects and principal of Hiland Hall Turner Architects in Gladstone. Together Alston and Turner fashioned a sunroom that combines classical elements used in a fresh way with some surprises inside and out. Municipal regulations limited the size of the addition, though Alston and Turner didn’t mind, explaining that an exaggeratedly large room would have looked out of place in relation to the rest of the home. But that meant something had to go from the wish list. In this case it was the pool table, which would have taken up half of the addition when accounting for the table and the area required for shooting pool. The final plan called for the sunroom to attach to — and be approximately the same size as — the existing family room; the dining porch, which would replace a deck, would be accessed through the kitchen and the new sunroom. the sunroom are the same proportion as those elsewhere in the home. A major architectural feature of the addition — a bowed window that takes up an entire wall — flexes between two exterior columns on a plinth, Turner says. Inside, a large, extra-deep window seat allows space for lounging. Another feature — hand-hewn reclaimed barn beams in the double-height ceiling gives a nod to the home’s woodland setting. Alston and Turner selected beams that are moderately distressed and then the centers were milled out so they would be lighter and easier to attach to the walls and ceiling. Adding to the rustic feel, Alston chose cleft (rough-textured) slate flooring in carefully placed shades of rose, gray and olive green. Underneath, a radiant heating system warms the room in cooler weather. the kind of details you can have when architects and designers work together. Alston’s sophisticated choice of furnishings adds comfort and warmth. 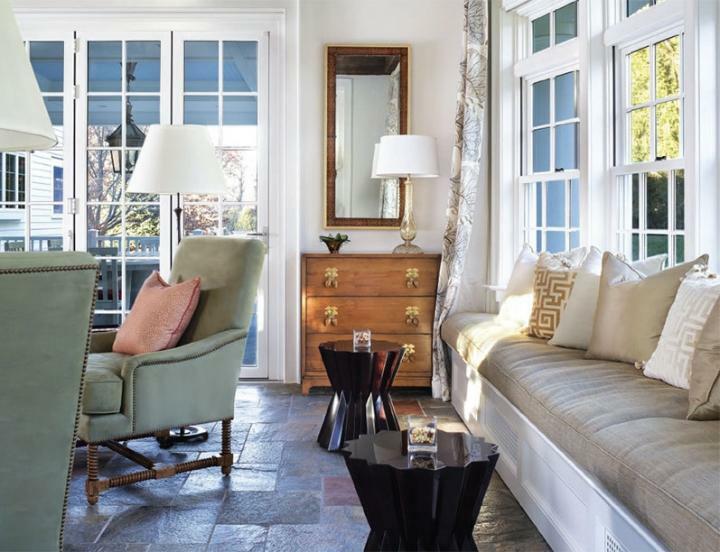 The primary seating area, for example, comprises a comfortable sofa with country French flair, two green Ultrasuede chairs with high backs (“with a double-height ceiling, you have to have tall pieces to balance the room,” she notes) and a coffee table to hold the family’s latest favorite-reads. The window seat provides another cushy seating area thanks to its four-inch-thick cushion with internal springs and plump pillows that encourage lounging, reading and gazing at nature outside. Inside the window seat is storage. The green chairs from the primary seating area can be turned to face the window seat if that’s where a group is congregating. On the right wall which is another focal point, Alston points out — coral chairs on each side of a rustic French-style sideboard under a television add a dash of color and can be easily pulled into either seating area as needed. Alston added some surprise touches with dark brown origami tables in front of the window seat and small coral snakeskinpatterned tables (not visible in photos) beside the green chairs. There’s more to the design than simply placing the furniture, Alston notes. “Besides where you place it, you have to think about the shapes of the furniture and how they relate to each other,” she says. “The first thing you see when you enter the room is the curvilinear table behind the sofa. Then you notice the curvilinear shape of the table lamps and the small tables beside the sofa. The curves lead your eyes around the room and also help to balance the heavy geometry of the beams. errant birds and bugs at bay, but if anything should happen to fly indoors, glass pocket doors between the sunroom and family room keep it from going any farther. Skylights bring in even more daylight. In addition, the television is placed strategically so it’s visible from either sitting area and from the dining porch — a must in this house of sports fans. The designer also found the requested space for a piano and a beverage center; they flank the entrance to the room (not shown in the photos). The beverage center is not large, the designer notes, but is functional thanks to glass-doored storage at the top, a stone countertop and refrigerator drawers on the bottom. For evening, Alston provided the curvy ivory lamps with a crackle finish and gilt base on the table behind the sofa, sculptural iron floor lamps beside the green chairs, a Murano glass lamp on a chest beside the window seat, and a wood-andiron chandelier. To be sure the details of the wood ceiling are visible after dark, she brought in lighting designer Robert Newell to handle uplighting in the ceiling beams. SOURCES design, J. Stephens Interiors in Mendham Township; architecture,Hiland Hall Turner Architects in Gladstone; builder, Brian Cahill Fine Homebuilding in Stockton; uplighting on ceiling, Robert Newell Lighting Design in Westfield; folding glass wall, NanaWall in Corte Madera, California; wood beams in ceiling, Boards & Beams Co. LLC in Fairfield; sofa, green chairs, sideboard (now retired) and chest near window seat, Chaddock in Morganton, North Carolina; table behind sofa, Niermann Weeks in New York City; lamps on table behind sofa, Christopher Spitzmiller in New York City; coral chairs and chandelier, Dennis & Leen (T) in West Hollywood, California; origami-shaped tables, Therien & Co. in Los Angeles; floor lamps, Objet Insolite (T) in Paris; Murano lamp on chest near window seat, Decorative Crafts (T) in Greenwich, Connecticut; mirror above chest, McLain Wiesand in Baltimore; drapery fabric, Jim Thompson Fabrics; paint color, “Simply White” by Benjamin Moore; floral arrangements, Flowers by Laura Clare, Floral Design & Event Decor in Bernardsville, Hoboken and Summit. T=To the trade. Design NJ: What is your favorite no-fail paint color?